Cindis World: PLUM emergency - Need #homemade #healthy #foodie help! PLUM emergency - Need #homemade #healthy #foodie help! When I took this picture I was so excited! I couldn't wait for this gorgeous flowering tree to produce tons of plums so we could pick them and start preserving, freezing, etc. Last year we had a late frost and lost all peaches, pears and plums, so I am bound and determined to make the most of this years bounty! 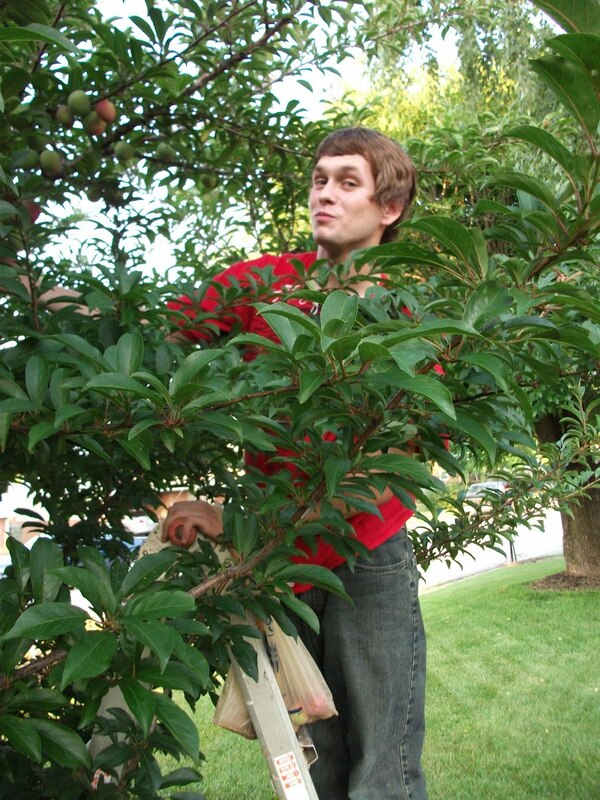 This is my son being 'cheesy' the other day while picking the plums that I cannot reach...yeah, he is a good kid. But now I am overwhelmed with LOADS of plums from ripe, to just about ripe in a fridge/freezer thingy in our basement. I have been looking up the different ways to do them, freezing, canning, making preserves. Any ideas? Any help would be greatly appreciated! I am so looking forward to seeing what happens. I love it!